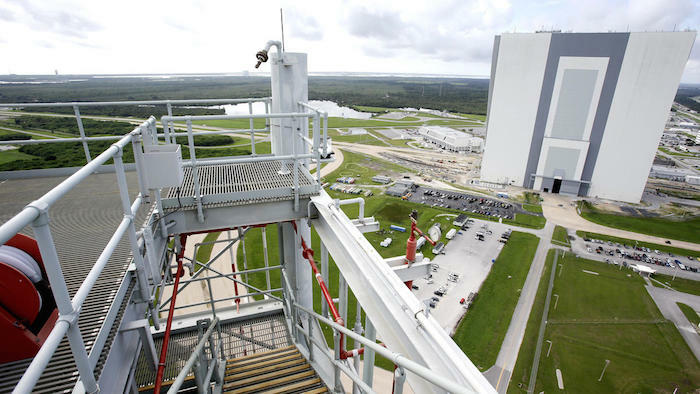 A view of the Vehicle Assembly Building, right, is seen from atop the over 400 foot high mobile launcher structure that will support NASA's Space Launch System (SLS) at the Kennedy Space Center is seen, Wednesday, Aug. 19, 2015, in Cape Canaveral, Fla. SLS is the agencys new rocket that will launch astronauts in the Orion spacecraft on missions to an asteroid and eventually to Mars. NASA gave the first look at its newly modified Mobile Launcer at Kennedy Space Center Wednesday. 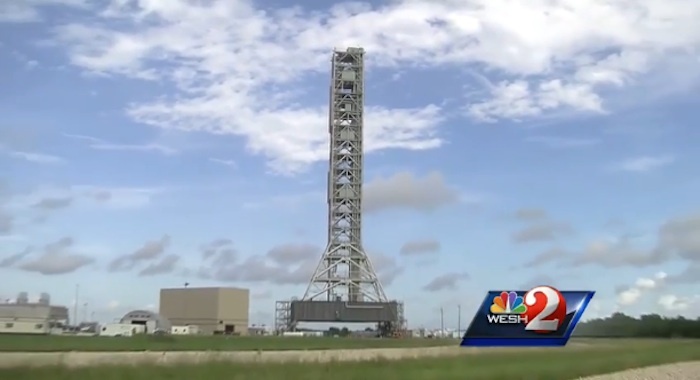 The launcher will host the Space Launch System (SLS) designed to launch astronauts in the Orion spacecraft on deep space missions and to Mars. The modifications and upgrades to the launch setup located at Complex 39 are overseen by the Ground Systems Development and Operations Program. 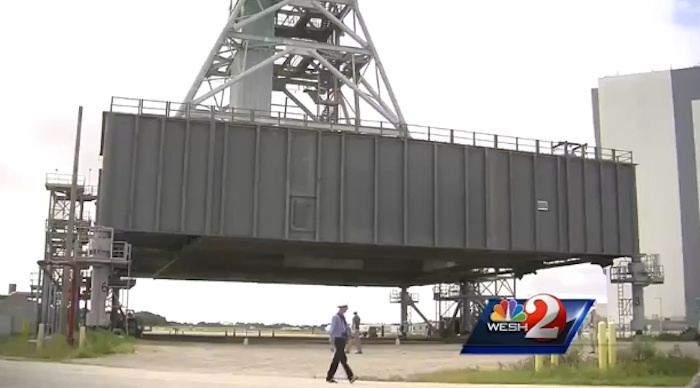 NASA awarded a $45.8 million contract to J. P. Donovan Construction Inc. of Rockledge to install the ground structures to support the mobile launcher. Last week, the space agency completed its next-to-last test on the SLS RS-25 engines at Stennis Space Center. The final test will be later this year. 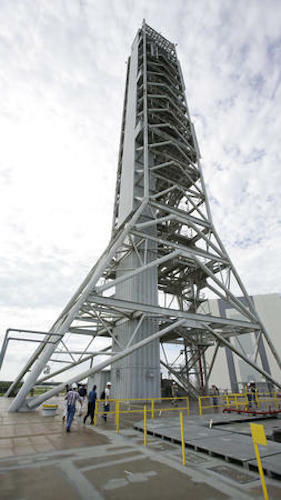 he completed mobile launcher structure that will support NASA's Space Launch System (SLS) at the Kennedy Space Center is seen, Wednesday, Aug. 19, 2015, in Cape Canaveral, Fla. SLS is the agencys new rocket that will launch astronauts in the Orion spacecraft on missions to an asteroid and eventually to Mars. 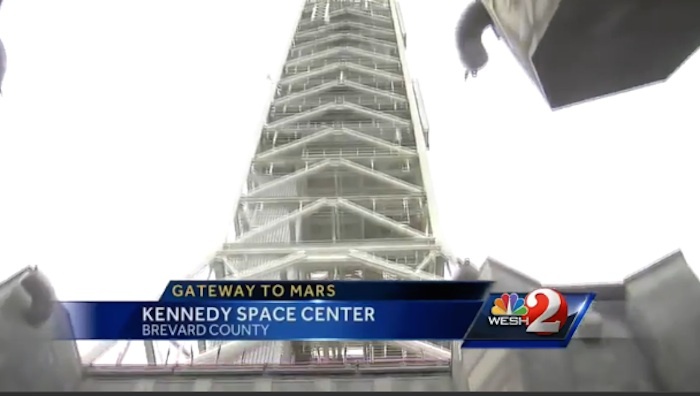 BREVARD COUNTY, Fla. —The gateway to Mars is now in place, and WESH 2 News got a firsthand look at NASA's new mobile launch tower. When astronauts travel to an asteroid, the moon and finally to Mars, they will ascend the tower. Eric Ernst helped build it. "Everybody's kind of awe-inspired when you work on a one-of-a-kind of thing like this. So, it means a lot to everyone here; it's kind of a once-in-a-lifetime opportunity," Ernst said. 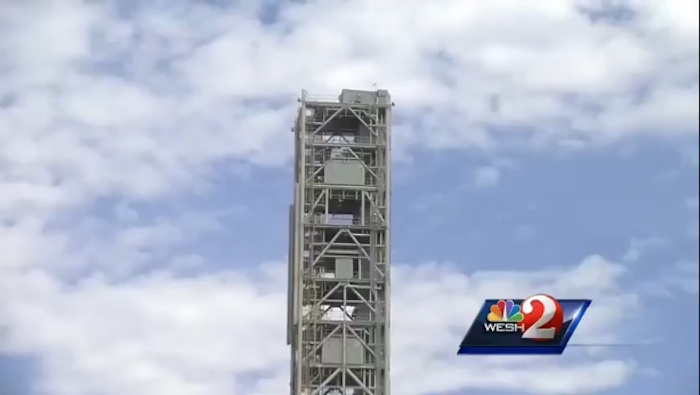 NASA calls the massive structure a mobile launcher. It's a tower and launch platform all in one, and it will be hauled to Launch Pad 39A to be the springboard for the world's largest rocket. NASA's planned SLS rocket is in the design stages. Last week, one of its huge engines was test-fired. The ground shook and the rumble was heard for miles around. To hold the mighty SLS, workers rebuilt a launch platform and tower that had been designed for a smaller rocket aimed at the moon. "A lot of strengthening, a lot of shielding had to be put in to survive the blast loads. So, that was a huge challenge," Ernst said. Astronauts will ascend the tower to climb into their Orion space ship. The view from the top is dizzying. At about 405 feet up, there will be cameras and weather instruments. The first launch off the new mobile launcher is expected in 2018. A launch to an asteroid could be 10 years away; to Mars, 20 years.